The Bay-Adelaide Centre was a proposed Toronto skyscraper that sat unfinished from 1991 until demolished in 2006. The tower was the last of a series of construction projects in downtown Toronto launched in the boom years of the 1980s. 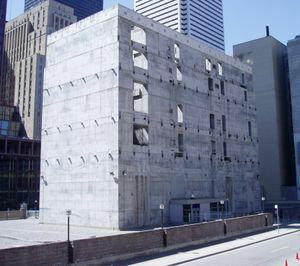 The Centre was to be a 57-storey office tower at the corner of Bay Street and Adelaide in the heart of Toronto's financial district. In earlier years a series of massive towers, such as Scotia Plaza, had been built nearby. The tower was to have cost almost a billion dollars. The building caused considerable controversy among those opposed to the erection of such massive structures. The tower stood far higher than was allowed by the city's official plan. To gain city hall's approval the developers committed some $80 million towards new social housing and other projects. A portion of the site was turned over to the city for use as a park that is now Cloud Gardens. Both of these deals went ahead, despite the tower never having been completed. Construction began in 1990, but the developers soon ran into problems. The economy collapsed and office vacancy rates in Toronto rose to 20%. Construction was halted, and in 1993, with over $500 million already invested, the project was permanently put on hold. All that was completed was the underground parking garage and several storeys of a concrete service shaft (See photo above) that stood as a monument to the failed project. For 12 or 13 years there were several attempts to revive the project but because of uncertain property values, all to no avail. Work commenced (again) in June 2006 and the concrete service shaft was demolished. Bay Adelaide West was completed in 2009 at 51 storeys. An announcement was made in June 2012 regarding plans to commence construction of Bay Adelaide East at 44 storeys. The development of a third tower, Bay Adelaide North has yet to be announced. Info and photo from Wikipedia.